CANTON, Mass. 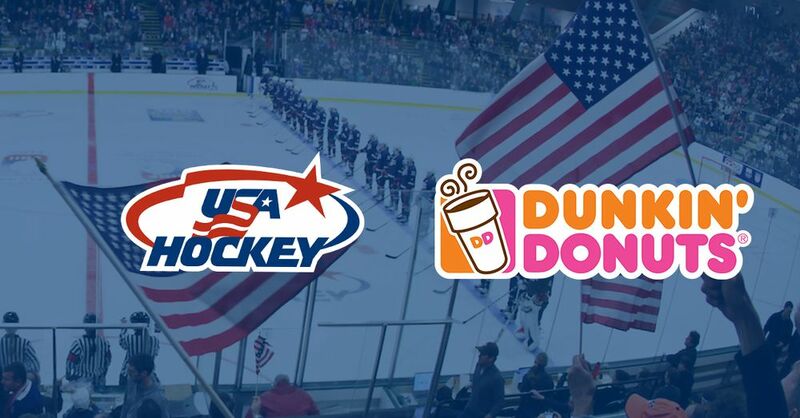 (February 2, 2016) – Dunkin’ Donuts has scored yet another key partnership to help support women’s hockey, today announcing a multi-year agreement with USA Hockey that includes designation as the Official Coffee Shop of the U.S. Women’s National Team. Dunkin’ Donuts will sponsor the U.S. Women’s National Team as it participates in key events, including the 2017 International Ice Hockey Federation Women’s World Championship and the 2017 Women’s Four Nations Cup. Dunkin’ Donuts’ agreement also includes advertising on www.usahockey.com and the brand’s logo featured on team practice jerseys. This partnership follows less than two months after Dunkin’ Donuts became the first official corporate sponsor of the new National Women’s Hockey League (NWHL). Dunkin’ Donuts also recently entered into a personal services agreement with two-time Olympic silver medalist Meghan Duggan, a member of the U.S. Women’s National Team since 2006. Duggan, a five-time world champion, is also a star of the NWHL’s Buffalo Beauts. Dunkin’ Donuts has a long and proud history of partnerships within the sporting industry, including the Arizona Cardinals, Boston Bruins, Boston Red Sox, Chicago Blackhawks, Nashville Predators, New York Rangers, New York Yankees, New York Mets, New York Giants, New York Jets, New England Patriots, Philadelphia Eagles, Philadelphia Flyers, Pittsburgh Penguins, Tampa Bay Lightning, and Washington Capitals. Meghan can be followed on her Facebook Fan Page (www.facebook.com/Meghan-Duggan), Twitter (www.twitter.com/MDuggan10) or Instagram (www.instagram.com/MDuggan10). Founded in 1950, Dunkin' Donuts is America's favorite all-day, everyday stop for coffee and baked goods. Dunkin' Donuts is a market leader in the hot regular/decaf/flavored coffee, iced coffee, donut, bagel and muffin categories. Dunkin' Donuts has earned the No. 1 ranking for customer loyalty in the coffee category by Brand Keys for nine years running. The company has more than 11,500 restaurants in 40 countries worldwide. Based in Canton, Mass., Dunkin' Donuts is part of the Dunkin' Brands Group, Inc. (Nasdaq: DNKN) family of companies. For more information, visit www.DunkinDonuts.com. USA Hockey, founded on October 29, 1937, and headquartered in Colorado Springs, Colorado, provides the foundation for the sport of ice hockey in America; helps young people become leaders, sometimes Olympic heroes; and connects the game at every level while promoting a lifelong love of the sport. USA Hockey is more than a million strong, including players, coaches, officials and volunteers that span all 50 states. The National Governing Body for the sport in the United States, USA Hockey has important partnerships with the National Hockey League, United States Olympic Committee and International Ice Hockey Federation. For more information, visit usahockey.com.